Welcome to September, the month of the International Week of the Deaf (IWD). One of the best ways to show gratitude to God for a quality life is to give back something to our community. We in S-DELI do so by advocating for the vulnerable groups in our society, we do so by “giving voice to the voiceless and speech to the speechless.” This is the month of International Week of the Deaf. 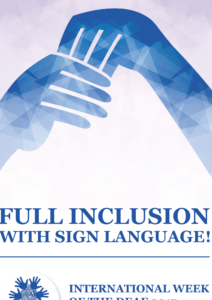 The theme for this year’s IWD by the World Federation of the Deaf WFD, is (Full Inclusion with Sign Language”; in this year’s IWD, we plan to launch our “CODAs and Parents Must Sign” Campaign, as we join the World Federation of the Deaf WFD to mark the 2017 IWD, from the 18th to 24th. 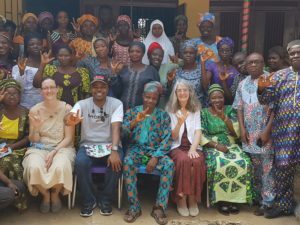 The campaign will be launched in about six States in Nigeria within that week, with various sensitization forums for family members of deaf children and deaf adults. Children of Deaf Adults (CODAs), and Parents of Deaf Children (PODCs) shall receive training on “The Practical Steps towards Learning to Sign”, after which, we will work with such parents, Deaf associations, and Deaf schools to implement the project at the various communities. we are still asking people with signed language knowledge, and people with passion to work with the Deaf (even without signed language knowledge), to volunteer with us. You can access our volunteer form on: www.s-deli.org/volunteer. We’re glad to contribute our quota in bridging the gap between the Deaf and the Hearing.